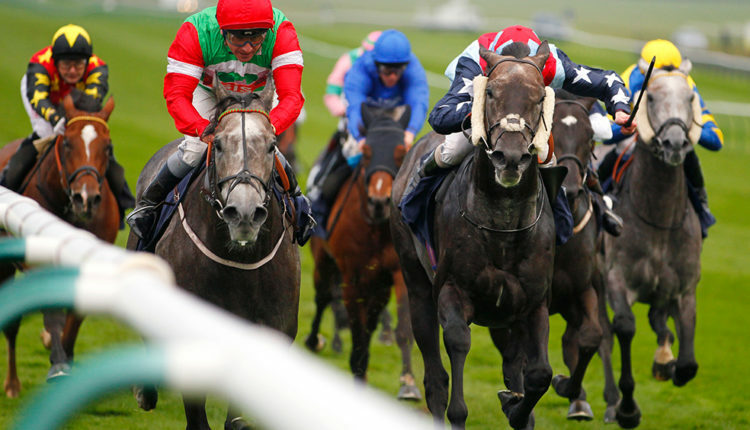 Haydock: Three Jumps Races To Take In…………..
Musselburgh: Flat Turf Action From Scotland……. Irish Grand National: Key Trends To Help Find The Winner……. Trainers Quotes: A TQ 1-2-3 On Another Top Week……. Hi, well that was nice last Saturday – wasn’t it? Hopefully you were all on Addeybb, who was a cracking winner for us in the Lincoln Handicap last week at Doncaster………. and really we never had a moments doubt! The William Haggas-trained 4 year-old travelled smoothly during the race just off the pace and when jockey James Doyle pressed the button the impact was instant! He bolted away from the 19 other runners to win by an easy 2 ¾ lengths and in the process give the Haggas camp their fourth win in the lucrative handicap. Next stop Listed and Group company for Addeybb we think! As we head into the Easter weekend the Saturday racing is not the best – we’ll admit that. However, with the Aintree Grand National Meeting now less then two weeks away then it won’t be long before we see a lot of the big jumping names back on the track, including Arkle winner – Footpad – who has been confirmed this week as running at Liverpool instead of staying in Ireland. We’ve still got the ITV cameras heading to Haydock (jumps) and Musselburgh (flat) this Saturday though, with seven races spread across the two venues. Oh, and as we enter National season we’ve also got the Irish version over at Fairyhouse on Easter Monday – we’ll cover that for you too with key trends and our idea of the likely winners. So, bundles to get stuck into and we’ll be hoping to find plenty more winners for you and as always, we’ve got it all covered with free tips and all key trends for the LIVE races. Enjoy! This Week At Trainers-Quotes………We Only Had a TQ 1-2-3 This Week!! With the weather having picked up in the last few weeks then the racing has been back on track and with that the TQ yards continue to reward members with top advice. Before we get onto that, top stuff from our Mick Appleby in the AW Trainers’ Championship. At the time of writing he’s in a sustained battle with Archie Watson but by the time you read this hopefully he’ll have secured more winners and the title. This week we’ve seen the continued form of the Jamie Snowden yard with Presenting Percy (1st 7/2) and his Some Day Soon (2nd 10/1) running crackers, while we had another TQ 1-2-3 – this time at Southwell with Red Touch (Mick Appleby), Spun Gold (Charlie Fellowes) and Fieldsman (Dave Griffiths) filling the first three home in a race there on Tuesday! Top stuff and another example just how valuable the TQ info is to members! TQ VERDICT: Jockey Daryl Jacob has a good record in this race – winning it in 2016 and 2017 – so he’ll be trying to follow-up with CREEP DESBOIS here. This Ben Pauling-trained 6 year-old is only 2lbs higher for his recent neck second to Colin’s Brother at Leicester and that rates solid form. He acts with cut in the ground and with only three career runs over fences should have more to offer. Aloomomo ran a bit better last time but don’t be too fooled by that second as he was still beaten 20 lengths by the Nigel Twiston-Davies-trained Crievehill, who could also run here. Masterplan is a consistent sort but he was actually third in the at Crievehill race too so looks to have a bit to find. Twenty Eight Guns, Native Robin and Jarlath, who gets in here with a very light weight which would make him dangerous in the ground, are others to note, but the main call goes to Creep Debois. TQ VERDICT: Only a few previous runs to go on here but it’s interesting that the Donald McCain camp are just 5 from 58 with their hurdlers at the track – with that in mind anything they run is overlooked. At this stage they’ve got Chti Balko, William Of Orange and Cousin Oscar. Both previous winners carried 1-4 or less in weight, while the Tom George yard often do well here with a 29% record with their hurdlers They run SUPER SID, who might be worth chancing despite flopping last time. He was sent off 9/2 that day so was clearly expected to run better than he did and it may hay been possible the ups and down of Chepstow didn’t suit. It would be a slight worry that the George yard are currently 0-from-18 at the time of writing but their decent track stats still suggest he might be worth risking. Before that bad run he’d shown promise to win at Southwell in December and then followed that up with a fair fourth at Market Rasen. The other of interest comes from the in-form Ian Williams yard – WOLFCATCHER. This 6 year-old ran a lot better to be third (of 14) at Kempton last month and off the same mark looks to have every chance of going close again as that ran also came off a 60 day break. Yes, that last effort also came on good-to-soft but should any further rain come then that’s fine having won on heavy too. TQ VERDICT: Abracadabra Sivola was a good winner last time out at Kempton but this Pipe runner is up another 5lbs here and also in a much better race. Yes, his very low weight would make him very dangerous but the runner-up from his last race (Invicta Lake) didn’t really frank the form in the week so he’s overlooked. In contrast to their hurdles record at the track, the Donald McCain yard do a lot better with their chasers here (31%), so if What Happens Now runs then this is a plus, while the stable’s overall current form is good. Tom George won the race in 2016 and could have Moss On The Mill, who was 6th in the race last year, heading to post this year. However, it is worth pointing out they are only 1 from 21 with their chasers at Haydock. POTTERS LEGEND often does well at this time of the year and could be the answer. Lucy Wadham’s 8 year-old look set to go close last time until falling at the last and if none the worse for that can hopefully make amends here. He was 7th in the Ladbrokes Gold Trophy (Hennessy) earlier in the season and previous to that fall had run well to be fourth at Sandown in a decent handicap chase. Off a mark of 130 he’s looking well-handicapped at the moment, especially after running 4th in the Kim Muir last season off 139. Behind Time is another that will be popular with Barry Geragthy riding for his boss JP McManus. This improving 7 year-old was an easy 4 length winner at Uttoxeter recently and a 7lb rise for that looks fair. He looks a big player from the Harry Fry team. TQ VERDICT: The Rebecca Bastiman yard often do well at the track with their older horses so their Hayadh certainly can’t be ruled out and wasn’t disgraced in the Lincoln last Saturday (9th of 20). He ran well for much of the way and only faded in the final few furlongs so this drop back to 7f is a big plus. Set In Stone, from the Adrian McGuinness yard, was a good winner here back in September but failed to build on that next time off this higher mark and in this grade when only 6th of 8 and a beaten 6/4 favourite. Yes, I think the horse is better than that and it could that last outing came too soon. A six month break would have freshened her up and being a proven course winner is respected. The McGuinness camp also run Sharp Defence, who comes out of last year’s winning stall 4. Talking of last year’s winner, then we actually get a chance to see the current champ of this race – TWIN APPEAL – try and defend his title and he looks of interest. This David Barron-trained 7 year-old took this off a mark of 89 last year so off 85 this year, plus Ben Robinson’s 5lb claim means he’s 9lbs lower this time. Yes, Hayadh beat him by 2 ¼ lengths at Wolves last time but he’s weighted to reverse that form now, plus the return to the turf (won 5 times on the green stuff) will suit better – he’s one for the shortlist. The Mark Johnston-trained MASHAM STAR is the other horse to have on your radar after running the useful Second Thought to 2 ¼ lengths in a Listed race last time at Wolves. He drops back into handicap company on what looks a useful mark and really that recent form is what all the others have to aim at. If there is a slight concern it’ll be that he’s only 2 from 26 on the turf, but 2 from 7 on the AW so the jury is still out that he might be a slightly better sand horse these days – we’ll see. TQ VERDICT: The Rebecca Bastiman-trained Royal Brave will be a popular winner with the race run in honor of their former stable star – Borderlescott. However, off a mark of 82 this 7 year-old have a fair bit to find with most of these so would have to improve bundles. So really, based on the ratings, it’s hard to look beyond the four that are rated in the 100’s – Caspian Prince, Alpha Delhini, Desert Law and Kylland Rock. All bar Caspian Prince come here off a break so their fitness has to be taken on trust but with a nice pot up for grabs there is every chance they will all be fully wound-up. Caspian Prince is now with Mick Appleby and with the yard having a 30% record at the track with their older horses then this is a plus. He’s a speedy sort that is also a proven course and distance winner but with 9-10 it won’t be easy giving weight away to all the others. Desert Law took this 12 months ago so based on that must be one for the short-list. He took this off a break last year so that’s a plus, however, at 10 years-old he’s not getting any younger. It’s also worth pointing out that he won the race on good-to-firm last year and despite having form with a bit of cut it will still be very different conditions. Draw 8 might also be a slight negative with ALL of the last 10 winners coming from 7 or lower. Kyllang Rock has been running in Listed and Group Three races with credit so is another big player. This 4 year-old is one of the least exposed in the field with just 14 career runs and seems to act on most ground. He won first time out last season too so everything looks in place for a big effort. However, the one I like here is ALPHA DELPHINI. This 7 years-old heads here having won his last two, including an easy 2 length win over course and distance last October. Off a rating of 107 (Caspian Prince 109) then he’s got the second highest mark in the race but actually gets 8lbs from Caspian Prince too. The ground will be fine and trainer Bryan Smart loves to target this race, having trained the winner in 2009, 2010, 2013 and 2015. TQ VERDICT: Only three past runnings but with all those winners carrying between 8-0 and 8-9 in weight then if this trend is to be repeated then only four fit the bill – Chingachgook, Shuhood, Hard Gift and Breaking Records. We also saw the three past winners come from stalls 3-6 inclusive – so the four that fit here are Ayutthaya, Chookie Dunedin, Miss Bar Beach and FAKE NEWS – it’s the last of that quartet, from stall 6, that I’m most interested in. From the David Barron camp that boast an impressive 25% record with their 3 year-olds here this horse caught the eye when winning very well at Wolverhampton recently. With just four career runs there should be more to come and running over a mile for the first time should also bring out more improvement – he certainly wasn’t stopping over 7f last time! Of the rest, the Richard Fahey team took this race 12 months ago so it’s no surprise to see them having three – Chingachgook, Indomeneo and Joe’s Spirit – all three command respect despite jockey bookings suggesting the Paul Hanagan-ridden Indomeneo might be their main one. Finally, Ayutthaya, from the Kevin Ryan yard, is also sure to be popular after winning very easily at Chester last September on just his third start. He looks set to go off favourite so is the one to beat and based on that recent win looks an above average sort. For those against him they might cling to the fact jockey – Tom Eaves – is only 2 from 44 riding 3 year-olds at the track. TQ VERDICT: Some familiar names on show in this stayers’ race, including the 2017 winner CARBON DATING (e/w) This 6 year-old took this off a mark of 101 last year so off 100 looks to have a very similar chance. He’s one of just two proven course and distance winners in the field so based on that is one for the shortlist. In fact, he’s also got the 3lbs claimer Rowan Scott riding so is actually 4lbs lower than last year. Yes, he’s not won since but has been contesting some hot races since, including several over in Dubai – he should find this easier. Mount Tahan, Night Of Glory and American Gigolo were all good winners last time and are sure to be popular in the betting as a result. Sir Chauvelin was a fair sixth in the race 12 months ago and with the Jim Goldie yard winning this is 2014 too then he’s respected. He didn’t get the best of runs 12 months ago too so would have probably got a bit closer to the winner – it is worth noting he is 5lbs higher this time though. Clever Cookie is a veteran in these staying races and off a mark of 108 could be dangerous based on his old form. He is, however, 10 years-old now so does look on a bit of a decline with his last win coming back in 2016. So, as well as last year’s winner, the other one I like here is TIME TO STUDY. This improving 4 year-old stayer rose up the ranks last season for the Mark Johnston team and rounded off last season with an easy win at Newbury. This trip looks ideal with this only blot coming when tried over further in the Cesarewitch last October, while with another winter on his back this young stayer should be a lot stronger too. He’s gone well fresh in the past so the 155 day break isn’t too much of a concern, especially as the Johnston yard are also firing in winners at a 23% strike-rate at the time of writing.